If you are looking for ways to learn how to bring more self- love and acceptance into your life and deepen your connection to self then we would love you to join Soul Coach, Tantra practitioner and Yogi, Caryn Hough for her Bliss Into Soul women’s workshop. The topic of Self Love is not a new one but one that we need to learn to consciously embody so that we can tap into our bliss state and understand that we are on this earth to enjoy all the happiness and pleasures we desire RIGHT NOW! Yes right now, not when we change xyz about ourselves or our external appearance or lives, but learn to go inwards to love and accept ourselves exactly as we are in this moment including all of our “perceived” flaws. Every single thing we are experiencing and seeing in our lives is a direct reflection of how we feel about ourselves on a subconscious level. It’s these feelings that carry a energy frequency that we vibrate out to those around us and out into the planet, we then attract back on that same frequency as like attracts like. It all ultimately boils down to the question – Do you feel worthy/ do you feel like you are enough and deserve everything you desire? A lot of us are unaware that we may even be carrying this story of “I am not good enough”, but when you take the time to reflect you can see the many ways it can be showing up in your life and holding you back from everything you really want. Loving awareness resides in your heart space, which is directly connected to our soul. It’s all about coming back to your true self and reconnecting to the divine inside you, knowing your worth, knowing you are enough just as you are right now. When we are stuck in our minds and old patterning/stories it can block our energetic momentum and flow. When you start to move blocked energy through various conscious techniques such as EFT, Yoga and pranayama then spontaneous emotional release can occur. Caryn will guide you through and teach you her favourite practices for cultivating self love that you can take home and embody in your everyday life. These practices done regularly will enrich your life as you learn to connect with yourself on a deeper level. Yin yoga – Working with the Metal element in Traditional Chinese Medicine (TCM) philosophy, we aim to release emotions – Metal can be the beginning of an alchemical process of transformation. Some of the most incredible things are possible in our lives when we can surrender our agendas and drop what we think we know what’s best for us. We will finish the workshop with a sharing circle and yummy raw chocolate cake. If you’ve been drawn to this event, it’s for you. Any woman who is on or wants to start her self love journey, wants to connect deeper with her body and her true feminine essence. No experience necessary – just turn up as you are. Wear comfortable clothing, bring a water bottle, journal and pen. 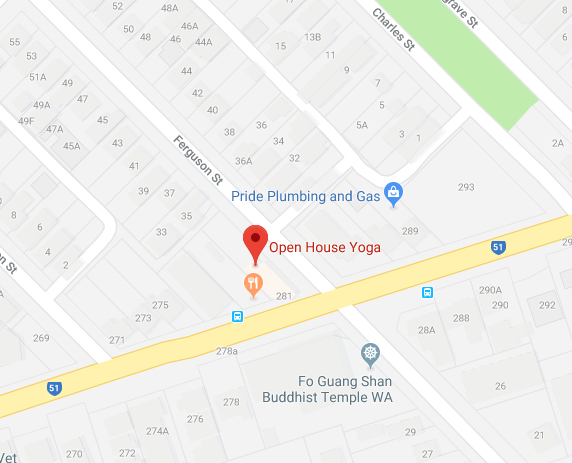 OPEN HOUSE YOGA – parking and building is located just off Guildford Road, turn left off Guildford Road onto Ferguson Street and you will see the sign on the left.